Where are Detroit’s active firehouses and where are the ones that have been closed over the years? Because of the type, nature and/or amount of information you are asking for, the Community Relations Division is unable to fulfill your request. Good luck in your endeavors. Unfortunately for the citizens of Detroit, the DFD has adopted a policy over the years of “browning-out” a company where the unit is not actually de-commissioned, but just sits and is never staffed. So while a company may “appear” active on paper, it never actually responds to a call for service. What would appear to be an easy task – the location of in service units – was not all that straightforward. Fortunately the historical pieces of the puzzle were easier to assemble thanks to the dedicated work of previous Detroit Fire Department Historians, namely Richard Lancaster, Clarence Woodard and John Randall, along with the contemporary work of Sheryl Jayson. The convention used on this website is as follows: The first piece of apparatus to occupy a new firehouse was given the designation E/L/WTn-x (where E=Engine, L=Ladder, WT=Water Tower; n=company number; x=sequential numbering of houses). For example, the first firehouse Engine 5 occupied was E5-1, the second was E5-2, and so forth. Once we could start putting dots accurately on a map, we could begin telling the story of the Detroit Fire Department: rapid growth, an optimistic future, grand firehouses and eventually the shuttering and disbanding of a great fire department. Through it all, the men and women of the Detroit Fire Department continue to answer the call despite the odds: Devil’s Night, layoffs, broken hydrants, broken rigs and arson. Since 1860, the City of Detroit has built 105 firehouses: As of March 2015, 36 remain active, 24 still stand that have been closed, and 45 have been demolished. The scope of this project thus expanded to include photos of past firehouses and apparatus. We hope you enjoy your tour. 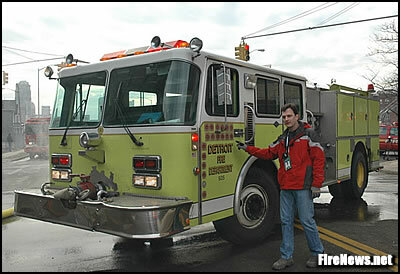 FDmaps.com Owner Jeff Harkey at a 3 Alarm fire in Detroit on January 28, 2006. Garry Watts Photo. If your are interested in contributing historical images to this site, please use the contact form to get in touch with us. 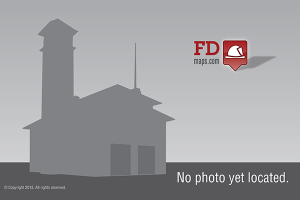 Current list of firehouses that need images.